As one of China’s leading full-service law firms, Han Kun has placed itself at the forefront of the legal profession in China by specializing in cross-border and domestic transactions. Han Kun is particularly well-known in areas such as private equity, investment funds, mergers and acquisitions, international and domestic capital markets, competition law, banking and finance, aviation finance, foreign direct investment, corporate compliance, private client wealth management, intellectual property and dispute resolution. 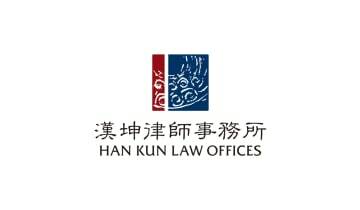 Han Kun has been consistently ranked as a Top Tier PRC law firm in the areas of aviation finance, private equity, mergers and acquisitions, investment funds, TMT and healthcare by authoritative international legal rankings, such as Chambers and Partners, The Legal 500, Asian Legal Business, Euromoney, The Asian Lawyer and the Asian-Mena Counsel. Han Kun currently employs nearly 200 lawyers at our four offices, strategically located in each of China’s major commercial centres, Beijing, Shanghai, Shenzhen and Hong Kong. Our lawyers come from a variety of educational and professional backgrounds. Most of our lawyers have extensive experience in serving multinational corporations and in handling cross-border transactions.